This is not a full build. Copy the contents of this archive into the ygopro 1.02C.0 folder! If you don't have version 1.02C.0 then click here to download. Fixed a wrong translation: "Select a card on opponent's side"
Great Job, tks Percival ^^ !!!!! -There's no room currently open on server ? -Newest Available version is beta 4 ? How come I keep getting " There no rooms currently open on the server " when I click on " TDOANE (USA) " ? someone found a fix for this ? Hey Percival18! I like all of your work with this game and really respect it. I've made a Yugioh Real life series in youtube that has 1.500.000 views at the moment, so if you don't mind i also make a mini-series, the main characters playing this game. I also mention the game's name and there is a link in the video's description to your blog, so maybe my subscribers and viewers will learn about your work too, if they haven't already. So best regards from Kacsa20, and keep up the good work. So I copied them into the ygo folder and I have all parts of the update with the exception of the new Deck Edit menu change. Check the photo that i attached. I created it on photoshop and i think is better if you can change only that area when a field card is activated. yes i agree, that would be better. I Agree too. This way is better than changing all the background. That definitely looks much cleaner. I like it. hello percy, for a while i say the dealta eagle(europe server) available in the server list. any idea why this is removed? if it is your own server i have to say this: way too go percy! the great genius! its a shame konami havent send you a request to work for them as an employee, because you deserve it! keep up your great work percy. I am testing stuff. And tdoane will be back online soon. First of all i would like to thank you for the amazing work you're doing. any idea on what might be causing it? so the TDOANE server is not hosting a game under the september 2012 ban list.is there something I cna do or is it the games fault or aproblem with the tdoane server etc..? Uhh no.. just be more careful with your moves. Can you come to the TDOANE Server room I need to talk to about some stuff or at the very least contact me via email on my personal site. It concerns bettering the game. I understand you are very busy but this is important. Does the game match banlists now? Would love to play goat control!!! i thing... this best than. Why can't i host with september 2012 banlist in tdoane? Because we have not updated yet. Percy your launcher has a bug in it that is crashing the TDOANE server; plz contact us. Kalut does not work in duels. Like when I have 2, it says Kalut is not allowed Try TCG/OCG even when I am in that mode. Do you have a approx date to when we are gonna start using September Banlist? I found a bug : The card "Sauropod Brachion" says that it can be normal summoned by tributing one dinosaur's type monster but it doesnt work. Could you fix it plz ? Btw, great job. precy, please add an option to duel an A.I to test newly made decks. Fluorohydride doesn't seem to have any plans on adding AI soon. Can I suggest you open ygopro twice and duel with yourself? lol!! Or you could find some friends in order to test your decks!! :D Seriously, I think it would be pretty awesome if an A.I. option is added sometime in the near future! 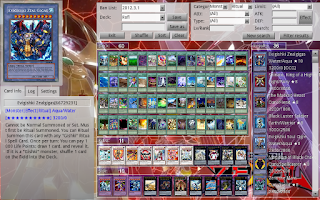 Can you come to our chatbox at ygopro.org, make your username Percival18 and talk to Seto_Kaiba or Access Denied. Power Wall is just an ANIME card so it won't be added in the game. uh Percy did promise anime cards before the start of his experimental builds, I guess that'll never happen. Or at least his not up for it. Are you still thinking about uting anime cards? because i think it whould be a awsome idea! That way its like we have tag-force exept on a PC and online! I think he doesn't have time for it, after all Percy is a very busy man. he never promised this. he was thinkig about it, it was just an idea. On a card is written that an effect of a card can be used Once per Battle, but my opponent could it use by any of my attacks. nearly a month ago and it is still not fixed. How long does it usually take for errors to get fixed, thanks? Percy...I'm going to post this on Fluoro's github as well, but there seems to be a problem with saving replays depending on where the installation directory is for ygopro. Long story short, I've made an installer for TDOANE for its web launcher and it installs to the users %appdata% folder under YGOPro. However, I, along with a few others, am now unable to save replays. The only change was the installation directory as it worked fine for me when installed to Program Files. When the duel is over, it just says "The duel has ended" without giving an option to save the replay. Please come to tdoane.com's chat and contact me, Starstrike if you have any questions. Once per battle, so each tIme you attack there is battle taking place. I think you are confusing it with once per battle phase. It does. I checked to make sure it did. I even have all my replays and can access them via the replay menu. Percy, I would like to make a suggestion based on one of your own features you added during beta releases. Advantage/Disadvantage music works when I have the appropriate mp3 for them, but I find that feature uselss to me so I don't put any of them. The problem is that the normal mp3 stops playing whenever I am in an advantage or disadvantage. My request is then: could you make an option in the settings menu to deactivate the advantage/disadvantage feature? Otherwise all the other features are a godsend. Thank you! Put the only TCG cards of teh Return of the Duelist like Imairuka and Revival Golem, please, I want test them :D! I've noticed a number of bugs with this beta here. Aside from that I've also noticed Thunder Seahorse and Shark Bahamut have not been added either. Personally I dont mind any of these bugs or anything else really. Even the card or two here and there not being published doesn't bother me. This is a fantastic game and I hope you keep working on this great game. I'm just looking forward to the new photon/galaxy cards. Hopefully you'll be able to use the pics (that are actually really great) that they have up now instead of actual release in middle of september. Maybe a weird request, multiple songs that can play in game? Either by choice or random? Maybe the more you want just name them "battle1.mp3 battle2.mp3 battle3.mp3 etc.." Just a small little thing lol. And maybe animated menus or backgrounds? And a final one, in theory it sounds easy but that's up to you. An avatar type system? A create a character thing would be awesome but I have no clue how ygo online does it so I'm sure uploading our own would suffice. These again are just some ideas and if you can put any in awesome! If not I'm still glad we have this program. And if you do decide to consider it, AI dueling would be very nice. Thank you. Yeah I have a glitch. When using heroic challenger extra sword with heroic champion excalibur, after using excalibur's effect to double his original attack he loses the 1000 attack boost from extra sword for some reason? You misunderstand how Shrink works. Shrink says "The original ATK of that monster is halved until the end of this turn. "Select 1 face-up monster on the field. The >ORIGINAL< ATK of that monster is halved until the end of this turn. ", so here's what happened. Shrink makes it 1500 ATK because Half of the ORIGINAL ATK of Sun Dragon (3000) is 1500. How do I fix the "Cannot Parse server data" problem? Actually it doesn't make his attack double his original, it doubles the original attack, meaning stat changes still apply. Same thing with megamorph. I think Thunder Seahorse is also missing for some reason even though it's been out for a while. Aside from those cards I really wouldn't mind seeing the new photon and galaxy cards. The preview pics are as high quality as the cards (since it's a pic of the actual card anyways), so they could be added too. Wait 102d is out? where? Why do people blindly follow shriek ? Oh somethings wrong with the server does anyone know why ? I've been noticing something wrong with the server as well. I still don't see wehre 102d has been released? Hey I just cant play... it says that there are no rooms in existance, do i have to forcefully download this new betaversion? or can i stay with the 1.02c build? Why thanks Perci ^^ have any idea when it will be back up? i try to play in chinese serever but i cant play. when i join or host appears error notif in chinese. its different from the 3 on your post. what shoul i do?? thanks!! Can anybody help me with my problem? percy, when i try to save replay, it either save a blank file or just a first turn. is that some bug? 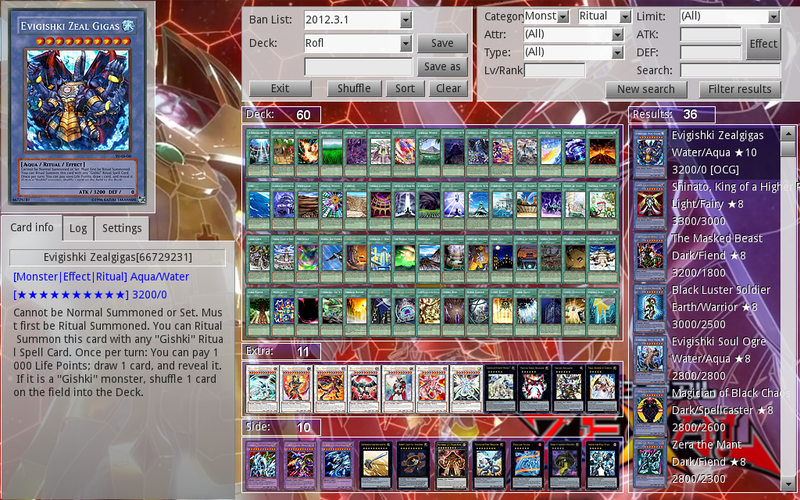 ans : if u have the beta one, use it instead use the prefious version or delete the prefiouse version of "ygopro_vs.exe". ex : FH can use 3 magic cylinder, meanwhile TDOANE use 2. so u can't use 3 macil in TDOANE server.